How to change the scene order? How to add scene transition effect? How to save scenes to My Scene Library? How to add and edit background music? How to import and export scene? How to copy/delete/replace a scene in your project? How to add scene remark? A scene remark feature is for you to make implications. If you have too many scenes to design, or sometimes you haven't finishing designing scenes, then you can add remark for scenes to mark information. Scrolling remarks will make your design more convenient. Follow the tips you can add a scene remark in project. 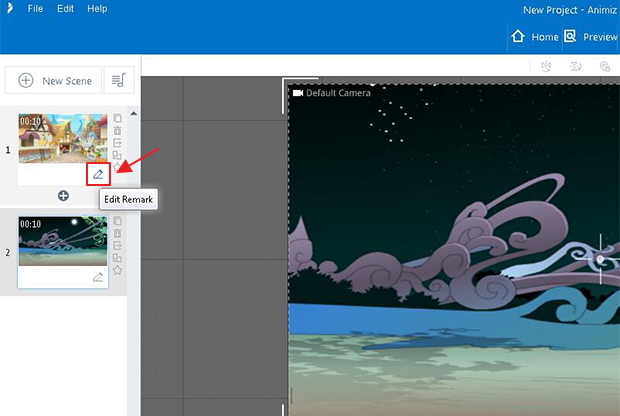 Click "Edit Remark" icon at the bottom of scenes, then input your remark contents, you can easily add remark for scenes. Previous：How to add scene transition effect? Next：How to change the scene order?